STRENGTHS Championship hand fighter on college level. Hands are strong, fast, efficient and lethal. Punch-and-discard winner. As rusher, swats are well-timed discarding tackle's punch attempt. Attacks the edge with good forward lean and works hands and feet in harmony on road to the quarterback. Uses jab steps and lateral movement to search for the edge of the blocker. Has leverage and strength to play right through redirects. 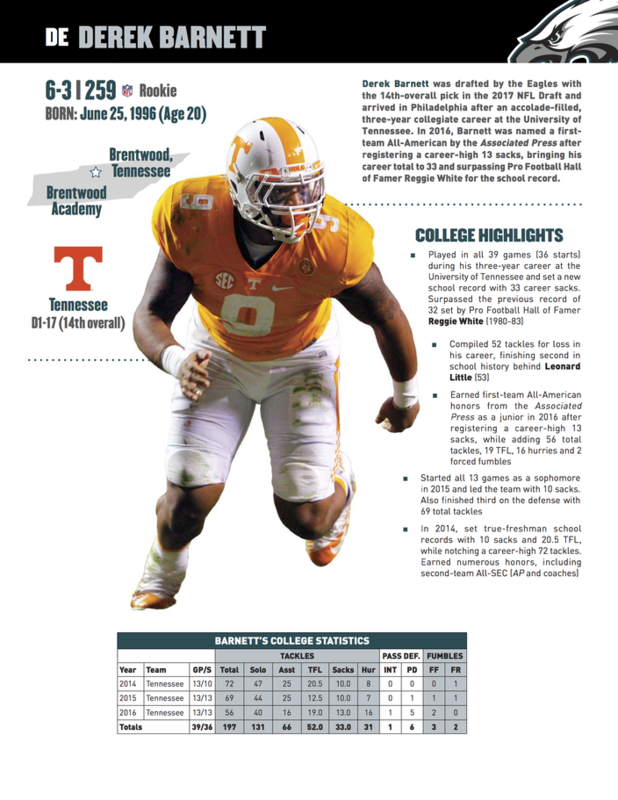 Elite production on par with former Vol and Hall of Famer Reggie White against run and as sack artist. Not content to just set the edge -- wants to make the play. Uses hand fighting and play strength to work through leverage points. Long strider who can crash down the line to challenge gap plays if unblocked. Punishing hitter. Delivers crushing tackles and sacks when given the opportunity. Hustle player who pursues the play with intent. Rag-dolls tight ends at point of attack. Plus field awareness recognizing play-action, reverses, and screens. Fluid enough to drop into space and play some zone. "I love the energy. I love the toughness. People either loved or they didn't like him because he didn't have explosive measurables in the combine. But his tape is too good and I think the city of Philadelphia is going to love him."